For building the Project Tracking website, we will use the following technologies - HTML5, CSS3, Bootstrap, ASP.NET Web API, Entity Framework, AngularJS and SQL Server 2012. The FREE tools to build the Project Tracking website are – Microsoft Visual Studio Express 2013 for Web or the latest Visual Studio Community Edition AND SQL Server Express with Management Studio .... 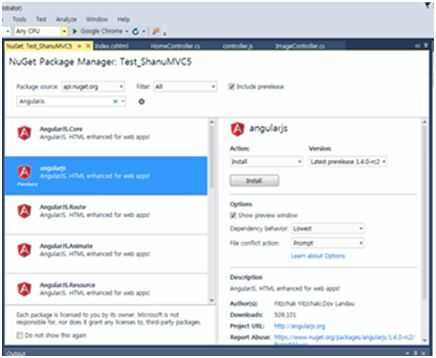 This article shows how IdentityServer4 with Identity, a data Web API, and an Angular SPA could be setup inside a single ASP.NET Core project. The application uses the OpenID Connect Implicit Flow with reference tokens to access the API. As a last task of the tip, we would add an Angular JS controller, that would connect this raw page with the data fetched from Web API. Angular JS Controller Right click on the Scripts folder and add a new folder, name it as ‘ app ’. Step 2: Adding Web API to the Web Forms-Based Project Thanks to Wasson’s article, I learned I could add a Web API controller directly into the existing project. Just right-click the project in Solution Explorer and you’ll see Web API Controller Class as an option under the Add context menu. Angular can manage collecting the updates to that state and send it to an web/api on the server. If you want to go more single page app, then the server side code would be just the initial state of your app.